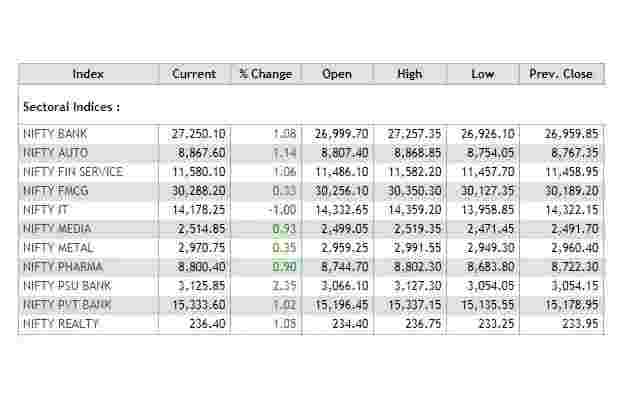 The BSE Sensex closed 181.39 points, or 0.51%, up at 35,695.10, and the Nifty 50 ended 55.10 points, or 0.52%, higher at 10,727.35. Here are the latest updates from the markets. The BSE Sensex closed 181.39 points, or 0.51%, up at 35,695.10, and the Nifty 50 ended 55.10 points, or 0.52%, higher at 10,727.35. Bank of Maharashtra Ltd said it will raise upto Rs 4,498 crore by issuing shares to the government. Bank of Maharashtra shares traded 2.18% up at Rs 15.45 per share. Repco Home Finance said it has entered into an agreement with Kotak Mahindra General Insurance Co and Kotak Mahindra Life Insurance Co for the purpose of distribution of their insurance products. The BSE Sensex gains 218.35 points, or 0.61%, to 35,732.06, and the Nifty 50 rose 60.70 points, or 0.57%, to 10,732.95. CMI Ltd said it has received a letter of intent for the maiden order worth Rs 20.93 crore from East Central railway for supply of 1144.64 Kms of Railway signalling cables. CMI shares traded 3.18% down at Rs 173.50 per share. Oil prices rose on Friday, shaking off early losses after China said it would hold talks with the U.S. government on Jan. 7-8 to look for solutions to a trade dispute between the world’s two biggest economies. Brent crude futures were at $56.33 per barrel, up 38 cents, or 0.7%, from their last close. U.S. West Texas Intermediate (WTI) crude oil futures were at $47.73 per barrel, up 64 cents, or 1.4%. ICICI Bank erased losses and traded 0.18% up at Rs 363.90 per share after the bank said it has signed an MoU with Small Business FinCredit India to jointly provide credit to MSMEs. The agreement is in line with RBI’s circular that allowed banks to engage with a non-banking financial company to co-originate loans for the creation of priority sector assets. 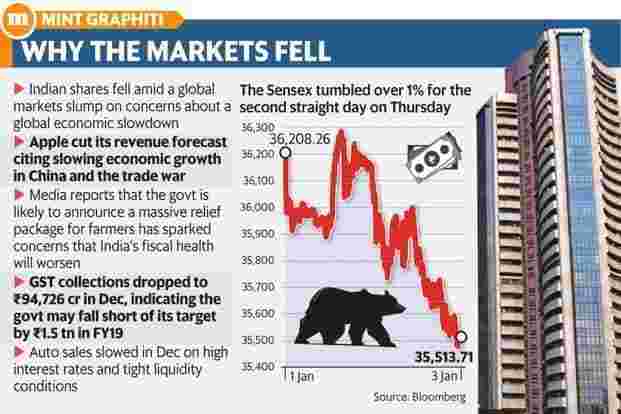 The BSE Sensex fell 41.75 points, or 0.12%, to 35,471.96, and the Nifty 50 was down 10.85 points, or 0.10%, to 10,661.40.The Sensex opened at 35,590.79 and rose 191 points to a high of 35,704.85. The Nifty opened at 10,699.70 and jumped 44.6 points to a peak of 10,716.85.The BSE midcap and smallcap indices declined 0.04% and 0.25%, respectively. Among the sectoral indices on BSE, telecom gained most at over 1% followed by utilities, power and oil and gas. IT and teck fell over 1%. 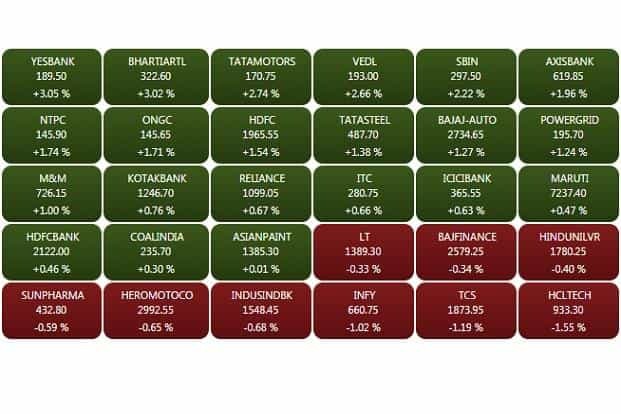 Consumer durables, basic materials and energy also fell.Tata Motors, Bharti Airtel, NTPC, ONGC and Axis Bank were among the top gainers on the key indices, whereas TCS, HCL Tech, Infosys, ICICI Bank, Reliance and Yes Bank were major losers. GM Breweries Ltd fell 10% to Rs 651.15 after the company said its profit for December quarter dropped by around 25% from a year ago to Rs 16.71 crore from Rs 22.30 crore a year ago. Jet Airways shares fell as much as 3.34% to Rs 238.60 per share after the Economic Times reported the company has proposed to its lenders that revenue from ticket sales be securitised against outstanding debt. The Indian rupee strengthened marginally against the US dollar, tracking gains in Asian currencies as dollar fell on weak US manufacturing data. At 9.10am, the rupee was trading at 69.95 a dollar, up 0.33% from previous close of 70.18. It opened at 69.97 and touched a high and a low of 69.90 and 69.99 respectively. The 10-year gilt yield was trading at 7.406% from its previous close of 7.427%.